Our Mission- to help individuals affected by cancer get physically and mentally stronger through a supportive and empowering community exercise program. 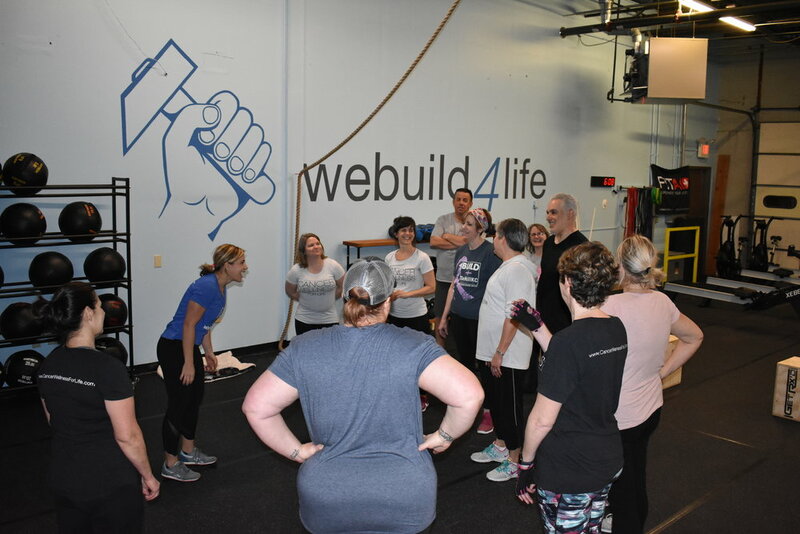 A. WB4L is a functional fitness program that focuses the individual needs of individuals affected by cancer. Our program is offered in a community setting to provide support, encouragement and a fun and strong community. Our program is offered both in the small group or individual setting and we will guide you to where we feel it would be appropriate. We suggest setting up an individual appointment first so we can meet you, see you move and discuss where we feel you would benefit the most. Q. What are your small groups like? A. Our classes are coach led from warm up to mobility. The coach will explain the workout, goals and intention for the class and lead the entire group through the entire hour. Throughout the class, the coach provides movement tips, encouragement and makes individual recommendations based on the persons goals and potential physical limitations. Q. How long are the classes? What if I’m not in good enough shape? A. Our standard WeBuild class is one hour. This includes explanation on the workout, demonstration and coaching. Each class typically includes a warm up, strength focus, metabolic workout and midline (core) or mobility. Each section is less than 15 minutes long with rest, recovery & water breaks built in. You can go your own pace and our coaches are very experienced in working with all levels of fitness and function and will guide you to what is appropriate for you. We also have a program called WeBuild Basics that we offer on a rotating schedule. This program is an 8-week class for beginners, it is 30 minutes of simple movements with a 15-minute wellness topic or discussion. It meets twice a week for the 8-week cycle. A. Our philosophy is “no athlete left behind” so the group stops and starts the workout together and while the amount of weight or intensity may vary – there is no first to the finish line. We write our programming so it works for all fitness levels. Saturday workouts are usually focused on odd object and partner workouts. But have no fear if you have had a bad experience being picked last on the playground, we know our athletes and will help partner you up! Q. What do I have to be able to do to complete a class? A. There are no requirements to be able to complete a class other than show up and try your best. We work with all fitness levels and are focused on finding the right movements for every athlete to feel successful. Q. What kinds of movements do you do in WeBuild4Life class? A. Here is a sample workout. Strength 12 min to work, alternate between exercises. For this workout, beginner athletes would complete these exercises with body weight only or very little load - exercises like the plank would be modified to a box. For fitter athletes, the weight would be heavier and they would complete more repetitions. or others would use heavier weight, go faster and complete more volume but everyone would work together. Q. Do I have to be a cancer survivor? A. Absolutely not. Our wellness & fitness center is open to anyone and our workouts and community is a great place for anyone to improve their fitness and meet other goals such as improved body composition, improved strength & endurance and all aspects of well-being. However, we put cancer at the forefront of what we do and we dedicate a significant amount of time, education and focus on the physical, emotional, nutritional and lifestyle needs of individuals who want to prevent, are going through, living with or have survived cancer. Q. What are all of the benefits of a monthly membership? A. Unlimited classes, up to 6 times per week. Nutritional coaching, support and personalized planning and dedicated time on individual goal setting. Q. What if I’m in cancer treatments? Can I join, and should I? A. You should absolutely exercise during cancer treatments. Exercise is the most important way to reduce your fatigue (LINK TO STUDY HERE) but will also help to reduce many other side effects and give you a feeling of control. Every person is different in that they may or may not benefit from the group classes but we can help in various ways. We may suggest you start individual training and developing a program for you or guide you into one of our small group classes. We will work with you to find the right place for you and your goals. Q. I’m getting ready to have surgery? Should I start prior or wait? We always recommend the time to start is now. While your goals or focus may change based on specific time points such as surgery or treatment. There are many reasons we suggest starting now. An active body usually heals faster than an inactive one. Exercise stimulates blood flow, improves sleep and improves mood. Tight and inactive muscles will recover at a slower pace and much of this tightness may contribute to more aches and pains post-surgery. Q. When can I start exercising post-surgery? A. While this all depends on the exact type of surgery you had, the usual time frame is 4-6 weeks. We encourage moving your joints as quickly as possible after surgery to promote healing and to reduce long term concerns such as a frozen shoulder. Early range of motion is also encouraged in many populations such as post breast surgery/lymph node dissection to reduce the incidence of lymphedema. Please contact us with individual questions and will discuss how to support your situation. Q. Can I exercise with neuropathy? A. Yes and keeping muscles active is very helpful to maintain as much proprioception as possible. That means keeping the muscles that support the affected areas strong and active to avoid falling or dropping things when you have lost nerve sensation. Many of our athletes who have neuropathy in their hands will wear gloves to reduce the cool feeling from holding a weight which can aggravate this condition. Q. I saw that you have yoga. What kind of yoga class is this? A. Our yoga class is for everyone especially individuals who are looking for yoga to supplement their other activities. Our yoga instructor Vicki is also a cancer survivor, who is also a WeBuild athlete. She used yoga as part of her recovery from cancer treatments including surgery, chemotherapy and radiation treatment. Her approach is to guide you into postures that feel good to you and teach you how to breathe and relax. Q. What if I am at risk for or have lymphedema? A. Great news that exercise, especially resistance or weight training is a key way to reduce your risk of or manage lymphedema! This is for both upper and lower body. Having a regular, consistent exercise program will reduce your risk of developing lymphedema. Our exercises follow evidence based recommendations that utilize incremental loading of muscles with weight. For individuals who have active lymphedema, we want you to follow the guidelines recommended by your clinical team. This often means wearing a compression garment when you exercise and sometimes after. We do modify certain exercises if an athlete is having challenges with an active case of lymphedema but the majority what we do is safe for everyone! Q. What makes WeBuild different than going to any gym? A. Two powerful components. Our community is a powerful reason that we have athletes that drive from all over the greater KC area. They are friendly, encouraging and welcoming. You will find that the community will not only encourage you but they will keep you accountable to keep showing up. There is something powerful to the person standing next to you having a similar path in the door. They have some of the same fears, frustrations and hopes and together the community makes each individual stronger. One of our founders Sami is one of the most experienced cancer exercise professionals in the world. She started her career in 2003 and has worked in health care, non-profit and community settings. Sami is a well-known speaker and writer and she oversees the programming in the wellness center and is one of our coaches. All of our coaches are certified and trained on cancer and functional fitness. Because our team works in cancer daily, we keep up on the latest treatments and needs of cancer survivors.